With summer comes hot and unpleasant temperatures across the globe and most people will rely on cooling units to help make the temperature comfortable. If you are currently considering a cooling unit then be aware that there are a lot of different types as well as countless brands. Finding the right solution for your needs comes down to knowing what the units do and why you should choose one over the other. 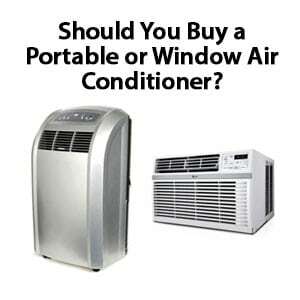 Below we review a few guidelines you can use to help you choose between a portable vs. window air conditioning unit. Before we get into comparing different kinds of air condition units, let’s first discuss how an air conditioner works. Air conditioners utilize refrigerants that are liquids specifically designed to help remove heat from the surrounding air. Put into coils that make up the inside of AC units, the refrigerant will change from a liquid into a gas when it takes on heat. Evacuating the heat outside, the cool air is left and the refrigerant turns back into a liquid to start the process again. A window unit expels the hot air outside while a portable unit will require some kind of exhaust pipe. While portable air conditioners and window AC units both work similarly, your particular situation will make one far better than the other. In general, there are two things that you should consider before you make your decision. Where will you be installing the unit? Do you have a place for a vent? What is the size of the space you are cooling? Is it a single room or multiples rooms? It is common for both businesses as well as homes to have HVAC (heating ventilation and cooling) units installed that provide central air and heat. While super effective, it is the most expensive option out there and several times the cost of a portable or window unit. The HVAC systems are also more costly when it comes to energy. If you are trying to cool only a single room, these systems cannot do that. It has to cool the whole home or business at once. A portable or window air conditioner on the other hand can cool one specific room, which makes these devices more cost effective. As a final thought, you can supplement your existing HVAC with a portable unit if one room is not getting to a comfortable temperature. This can be a far cheaper alternative to updating or improving your existing HVAC system. By far a portable unit is the easiest one to install in a room. Your unit will most likely come with a kit to take the exhaust out through a window. Another benefit is that they are not an eye sore from outside the home. Some associations ban the use of window air conditioners because they hang out and are considered unattractive. The mobility of the unit means that you can easily change its location depending on where the greatest need is. Along with installing the exhaust through a window, you can also hook it up to an existing exhaust system, like your kitchen exhaust to cut down the cost and keep your window free. Take a look at our more in-depth article on how to choose a small room air conditioner here. Want air conditioning without taking up your interior space? A window unit will provide all the benefits of a portable unit when it comes to cooling without taking up any space. You will also not have to worry about the exhaust as they are built in such a way to vent outward. In addition to taking up less space, a window air conditioning unit typically requires less electricity. Measured in British Thermal Units (BTUs), air conditioners typically come with a rating that you can use to judge how efficient they are. When the number is higher, the amount of space that can be cooled is increased as well. Typically, units will provide an estimate for what sized space they can cool. For more information, check out our other article on the best rated window AC unit for different size rooms. If you’re looking to cool a small space and save the most amount of money, we also have a guide on buying a cheap portable AC unit here. Noise: For some people, noise matters. Different units will produce different amounts of noise ranging from barely noticeable to loud. The noise level is measured in dB (decibels) with higher numbers meaning louder noise. If noise bothers you, aim for a unit with a low number.